As long as you follow the ANSI/TIA/EIA-568-B Standard, most of your communications infra-structure will be pretty similar and will not vary based on whether it is supporting voice or a specific data application. The horizontal cables will all follow the same structure and rules. However, when you start using the cabling for data applications, you’ll notice some differences. We will now take a look at a couple of possible scenarios for the usage of a structured cabling system. The first scenario, shown in Figure 7.14, shows the typical horizontal cabling terminated to a patch panel. The horizontal cable terminates to the 110-block on the back of the patch panel. When a workstation is connected to the network, it is connected to the network hub by means of a RJ-45 patch cable that connects the appropriate port on the patch panel to a port on the hub. The use of a generic patch panel in Figure 7.14 allows this cabling system to be the most versatile and expandable. Further, the system can also be used for voice applications if the voice system is also terminated to patch panels. Another scenario involves the use of 110-blocks with 50-pin Telco connectors. These 50-pin Telco connectors are used to connect to phone systems or to hubs that are equipped with the appropriate 50-pin Telco interface. These are less versatile than patch panels because each connection must be termiated directly to a connection that connects to a hub. In past years, we have worked with these types of connections, and network administrators have reported to us that these are more difficult to work with. Further, these 50-pin Telco conectors may not be interchangeable with equimpent you purchase in the further. Figure 7.5 shows the use of a 110-block connecting to network equipment using a 50-pin Telco connector. The previous examples are fairly simple and involve only one wiring closet. Any installation that requires more than one telecommunications closet and also one equipment room will require the service of a data backboane. Figure 7.17 shows an example where data backbone cabling is required. Due to distance limitations on horizontal cable when it is handling data applications, all horizonatal cable is terminated to network equimpment (hubs) in the telecommunications closet. The hub is then linked to other hubs via the data backbone cable. 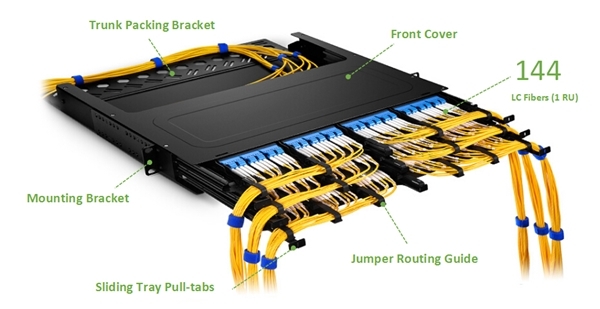 Now recommend you two fiber optic patch panels, following picture shows the details. This 12 port fiber patch panel is designed to fit on a standard 19″ rack and provide optimal protection for your fiber optic applications. There are two cable entry points on the back of the fiber housing fitted with rubber grommets to protect the fiber optic cable from damage. Along with being loaded with 12 SC connections, each fiber enclosure includes one cable routing spool and one 12 fiber splice tray. Also included are zip ties, cable routing clamps, mounting screws, fiber splice sleeves and installation instructions. The 24 Port Fiber Patch Panel is fundamental to network system operations; whether it be testing, organization, or maintenance, we as users rely on accessible and dependable panels. Let us help you maintain your network with our Fiber Optic Patch Panels. These sliding rack mount panels feature 24 ports and come pre-loaded with 24 SC Duplex multimode adapters. If you have a few patches to make right away, make use of the included fiber management kit, which has some essential goods such as a PG 13.5 cable gland, 1 splice bridge, 8 bunny clips, 24 fiber strands, and 1 warning label for good measure. These rugged steel panels are finished with black powder coating for a clean finish, are 1U (1.75 in.) height for easy installation and access, and come with labels for easy identification during use. Our fiber optic patch panels feature anywhere from 6 to 576 ports for the ultimate in flexibility and convenience. Plus, they’re available with LC, SC or ST connections – you’ll be able to integrate any component or piece of equipment, old and new. For modular and cabinet applications, Fiberstore carries rack mounted units that easily install in standard 19″ racks, as well as fiber patch panel wall mount units that feature built-in cable management. The cable layout should be designed and a cable pulling plan developed, using the findings obtained during the site visit.The proposed cable layout should be drawn on to an existing cabling diagram of the site if it is not a new site installation. The cabling diagram that is used should include all existing cabling and cable housings. For example, all cable trays, conduits and pole lines should be illustrated. For the purpose of orientation, it is essential to incorporate outlines of buldings, roads, and fixed machinery in the diagram. The new fiber optic cable routes should then be drawn over the top of this with a dark pencil. Termination cabinets and fiber node points containg splicing trays and patch panels should also be drawn on to the diagram in pencil. A typical building cable network layout is shown in Figure 1. In some countries, according to their loacal fire prevention codes, outdoor cables that are filled with jelly should be spliced to non-flammable indoor cables close to the cable entries. Alternatively, the fibers can be cleaned and enclosed in protective sleeving ‘zero cable’, and taken to the patch panel or optical fiber distribution frame (OFDF) directly. The cross-connection arrangements and distribution hardware needs to be specified for each cable. In the market, there are type of fiber patch panel, for example, 12 port fiber patch panel, sc fiber patch panel, 16 port patch panel and so on. Our store offer you different types fiber optic patch panel to the customers, now we will introduce two hot sale types in our store. This Black box patch panel secures 12 breakout modules in the horizontal or zone distribution areas. It features a low profile that requires little wall space, as well as a large routing space for accessible patch cabling entrance. Top and bottom grommet holes provide easy entrance for the horizontal trunk cables. Incorporated spool rings can secure and store excess cable lengths with a safe bend radius. With this High Density 24 port patch panel, you can easily make one rack unit support your 10GB or higher applications. They allow you to quickly add new devices to your system without having to manually install or reconfigure other devices. The fiber is routed and connected on the inside of the cassette. There is no cutting, polishing, or terminating. These patch panels are perfect when you have high fiber count installations. Figure 2 illustrates a typical cable layout diagram. Note that the diagram includes the cable fiber sizes (the number of strands in the fiber) to be installed, the locations for new and old pit boxes, the requirement for new conduit and for fiber optic termination cabinets. If a fiber ring is being formed, the cables are normally cut in the pit, both ends are taken into the building where they are either spliced through or pig-tails are connected to the fibers before taken to a patch panel. Often, there is combination of spliced fibers (which are more secure compared to those on a patch panel) and fibers with pig-tails taken to a patch panel. Taking them to a patch panel allows the rings to be made or broken as required, but leaves them free to accidental removal. Compare the length of each cable run with the length of fiber optic cables on the reels that are to be used. Using this information, determine the location of any additional intermediate splicing locationg that are required. Once the cable layout diagram is complete, a cable installation program should be drawn up. This document will be used by the contractor’s installation procedures and requirements. It should contain a thorough description of all the considerations and potential problems that were noted during the site survey. The logistics of pulling the cable. Where the pulling equipment and cable reels should be located during the installation for each separate pull. The precise location where the pit boxes, termination cabinets and splicing trays are to be located. Which fibers are to be spliced and which fibers are to be taken through to a patch panel. Each separate cable pull and the cable size and type to be pulled. Each separate conduit installation and the size and type of conduit to be installed. Specify which conduit is to be used over each section. Which cable trays are to be used. The routes to be taken for cable runs through the roof space. All the cable trays, conduits or other housings that will need replacing. An installation schedule that would minimize traffic congestion while carrying out road works during peak hours. The setting up of ‘no parking’areas where installation equipment is to be located. This should be carried out the day before the installation begins. This requirement should cover all pit boxes and manholes. All observations that were made during the site visit. The specific responsibilities of each member of the installation team should be defined. When the installation is complete, document all the changes made during the installation and produce final‘as installed’drawings. This will help to ensure that the cables have been installed correctly and that future fault finding and any system upgrades will be hassle free. As previously mentioned, fiber optic cables have a very small core that can be easily damaged if not protected properly. Also, to conform to the minimum size of a fiber optic loop and not violate the critical angle, we need to have a way to keep excess fiber optic patch cables, as well as terminated building fiber, neat and protected from damage. 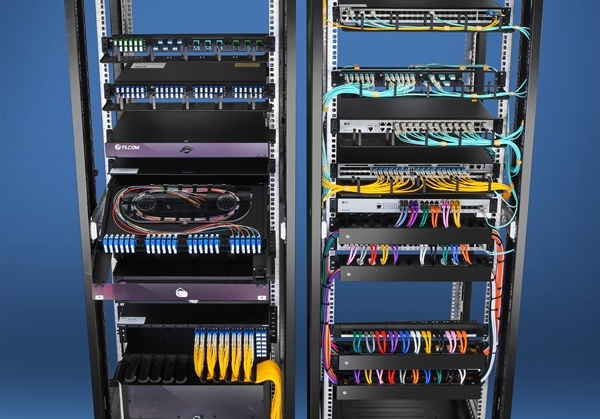 Fiber-optic enclosures and patch panels allow the cable installer to protect the delicate fiber cable from damage, while still making it useable for the network adminstrator. A commmon device that is used as a fiber-optic cable enclosure is called a Lightguide Interconnection Unit (LIU). The LIU provides a location to terminate individual fiber-optic strands into a patch panel, which will be discussed in the next section. An LIU is generally made of galvanized steel that is then power-coated to provide durability. Most major LIU manufactures make their devices 19 inches wide so they can be installed in a normal communications rack. If the LIU is to be located in an enviroment where there is a risk of moisture or corrosives, the LIU can be sealed with gaskets to make it virtually waterproof. Most LIUs have swing out trays in the front and the back to provide easy access to the patch panel located inside. Also, most LIUs provide a place to route excess cable to ensure that all loops are of a minimun diameter, so the cable will not get damaged and maximum ligth can traverse the cable. Patch panels for fiber-optic cables are usually installed into the LIU. Because the core and cladding of two fiber optic cables that are to be joined together must match perfectly, the patch panel must be manufactured to exact specifications and some standard type connector must be used to ensure a good fit. (Fibe-opticon connectors are discussed in the next section.) Another patch panel issue deals with attenuation. Remember from the previous discussion that when you splice or join a fiber optic cable, you can introduce additional ligth loss or attenuation. The same holds ture for the fiber optic patch panel. The connectors on the patch panel should identify total loss at various wavelegths, and these losses should be added to any other cable loss on that particular cable to ensure compliance with standards and good operation of the fiber optic cable. Now we will introduce you two fiber optic patch panel in the market, they are 12 port fiber patch panel, 24 port patch panel from our store. 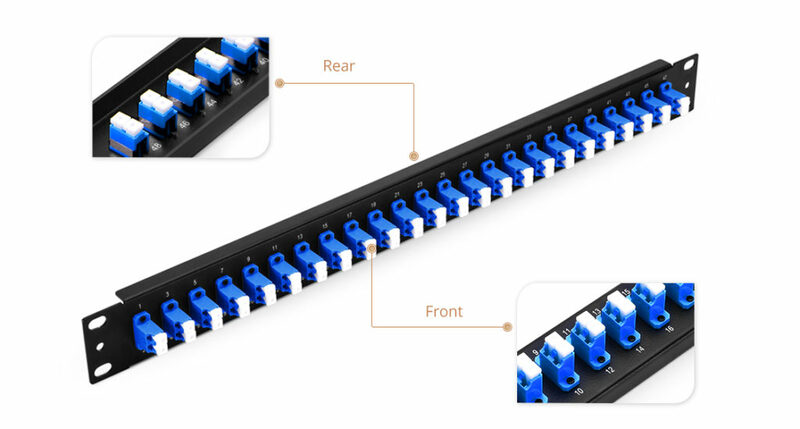 The 12 port fiber optic patch panel can be loaded with SC/LC/FC/ST adapters on the panel, front panel port are optional to fit simplex or duplex adapters, the fiber optic patch panel is loaded with inside trays and accessories. 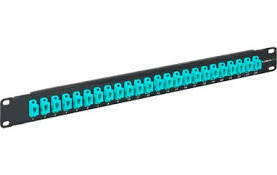 The 24 port fiber optic patch panel is reliable fiber optic organization and distribution products, it is sliding type, convenient for operations and maintenance, The 24 port patch panel has wide operation temperature and suit density fiber optic installations. Application: It is applicable for straight-through connection and diverged connection in aerial layout. It can protect fiber connectors commendably. Fiber optic patch panel is an integrated unit for fiber management, we offer wall mount patch panel and rack mount patch panel, these equipment function is to fix and manage the fiber optic cables inside the box as well as provide protection. There different models to fit for 12 core fiber, 24 core fiber, 36 core fiber, 48 core fiber, 72 core fiber and 96 core fiber applications. They can be with different adapter interface including the SC, ST, FC, LC MTRJ, E2000, etc.